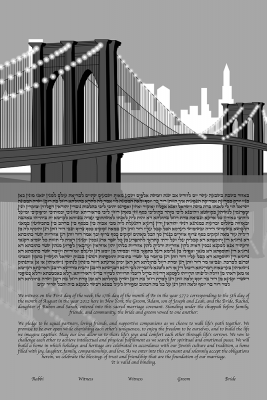 A monochromatic image of the Brooklyn Bridge against the city’s recognizable skyline paints the an elegant background for a chic Ketubah. The always-busy bridge is devoid of the city’s hustle and bustle and sparkles in utter silence over the still river. Lights illuminating the architectural pathway is a gentle reminder that it is alive and ablaze with energy. See Alternate Versions Of This Ketubah!